Creating display shelving space in an open loft environment can be a challenge. Open spaces present unlimited opportunities but at the same time without proper structure can be overwhelming. 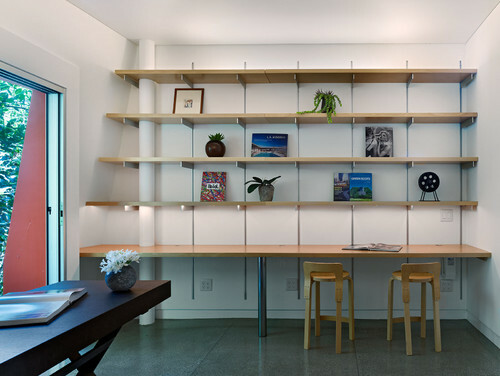 Installations in Los Angeles, New York and Santa Monica are examples of transformations in which Rakks Wall Mounted Shelving Systems have played a supporting role. 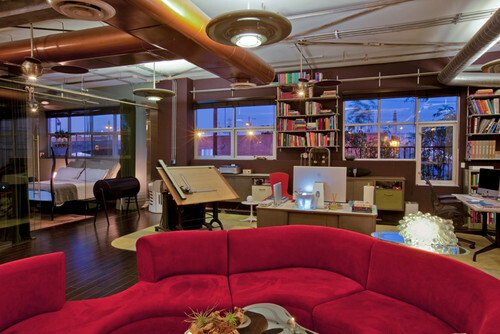 This artist’s loft in one of LA’s “Hottest Neighborhoods” is a testament to Rakks versatility. Using Rakks Wall Mounted Standards, a custom shelving system was created. Rakks Standards provide storage space for a book collection without sacrificing modern form. The shelving systems frame the spectacular view and the interconnected wall standards expand the horizontal feeling of the space. Pictured below is a expansive shoe and clothing collection that was featured on a “shoe wall“. The wall is lined with Rakks aluminum shelving on recessed standards. Floor to ceiling sliding panels provide privacy and a sleek visual experience . The anodized extruded aluminum finish of Rakks shelving blends seamlessly with the finish of the dresser. Each room in this Santa Monica home by Kevin Daly Architects opens to the outdoors. All the interior design elements (including the shelving) contribute to the modern, wide-open theme. This space incorporates shelving that varies in depth depending on the shelf height. This opens up the space to the ceiling while having the bottom shelf function as a working desk. These are wooden shelves on Rakks Brackets of various depths.